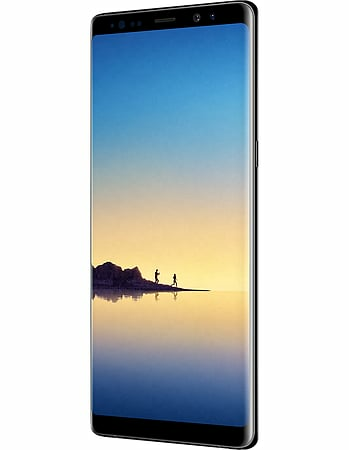 One of the most impressive things about the Samsung Galaxy Note 8 is the 6.3-inch Infinity Display with Quad HD resolution that wraps around both sides of the phone. Whether you’re watching a video or browsing the web, the Galaxy Note 8 is ready to let you experience things bigger than ever before. 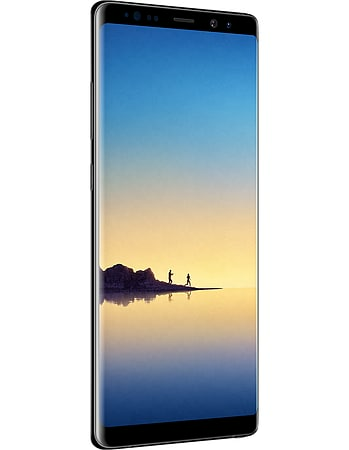 The ultra slim profile of the Galaxy Note 8 is just another one of it striking features. Measuring just 8.6mm thin, it leaves just enough room for the new and improved S Pen to slot in the bottom. Now with even greater sensitivity and a thinner tip for increased precision, you can put pen to virtual paper like never before. The Galaxy Note 8’s dual lens wide-angle 12MP camera guarantees stunning photos every time. Featuring OIS for smooth video, and a 2x optical zoom, you can get closer without losing any quality in your shots. And when you want to capture every last detail on film, the Galaxy Note 8’s 4K video capabilities will not disappoint. With resolution this high, you can watch your footage back on a much bigger screen without losing any of the quality. The performance of the Galaxy Note 8 is also on the large side. With a powerful Octa-core 64-bit processor and a whopping 6GB of RAM, you’ll never have to worry about slowing down, no matter how many apps you’re running at once. There’s also 64GB of internal storage for all your favourite photos, songs and videos, and if that isn’t enough you can increase it with the use of a MicroSD card up to 256GB! A massive 3300mAh battery keeps the Galaxy Note 8 powered up all day long. And for added convenience, wireless charging is built in for when you need to top up on power. The Galaxy Note 8 is IP68 certified, meaning it can withstand fresh water and dust, and can be safely submerged in 1.5m of water for up to 30 minutes. If you want even more security than the traditional fingerprint scanner which is located at the back of the phone next to the camera, then the Galaxy Note 8 has got you covered with the built in iris scanner. This allows you to unlock the phone with the unique pattern of your eyes. The Galaxy Note 8’s 6.3-inch Infinity Display is huge, but if that’s not enough you can go even bigger with the use of a DeX Station (sold separately). By docking the phone in this smart cradle, you can boost your mobile experience up to a full-scale desktop, with all your favourite apps automatically resizing for use with a mouse and keyboard. • Dual Audio: connect two Bluetooth devices to the Galaxy Note8 to play audio through the two devices simultaneously. • Scalable Codec: Bluetooth connection is stable even with ambient radio frequency interferences. • Recording quality is improved with the High AOP Mic that mitigates distortion in noisy environments. *Galaxy Note8 and S Pen are rated IP68, meaning they are both protected against dust ingress and are water resistant. Water resistance rating is based on test conditions of submersion in up to 1.5 meters of fresh water for up to 30 minutes. • Secure Folder: a secure space on the device to keep content such as apps, photos, movies, and files private using either iris scanning or fingerprint scanning.